Visual Query is Tailor Made Software's system for linking CAD drawings and company database information Visual Query is designed to minimize the complexity of the process and the requirements for both hardware and software, but at the same time to allow seamless integration with legacy systems and databases. Visual Query allows the user to interact with data from company databases. But the interaction is not just pages of text. Visual Query allows the user to see the results of the query on a drawing. Visual Query provides the interactive visual component to a large number of verticals. 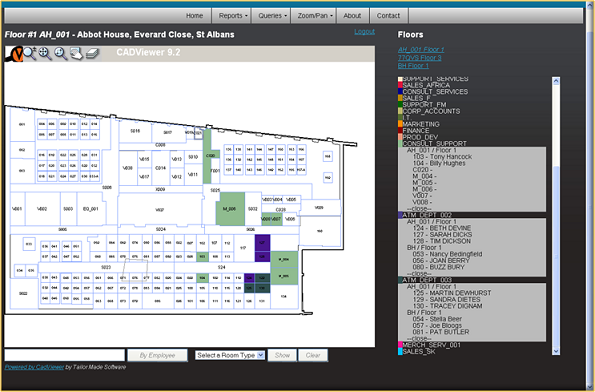 Visual Query can be used as a CAFM extension component, a reporting tool, an Enterprise Asset Management visualization component, a Corporate Sales Tool in Real Estate or Hotels, a Corporate Customer tool for people, booth, shop or seat finder, to name a few. See our sample VizQuery Applications. Queries are routines that are run against the data from the database and highlighted to the user. Visual Query not only displays the data in a text view, but also graphically displays the information to the user. Queries can range from simple "Show me all rooms in department XYZ" to the complex like "Show me all unoccupied rooms larger than 120 sq ft on floor 4". Visual Query goes beyond just showing the results on the drawing. The user can click on the drawing and run a predefined query. For instance, click on a room and Visual Query will get the room detail information from the database and display the results, just as if the room name had been chosen from a list of rooms. Tailor Made Software has a solid base of satisfied customers in a very diverse set of industries. They all have in common the need to integrate in their business processes, either advanced file conversion solutions or visualization and collaboration tools for CAD data.